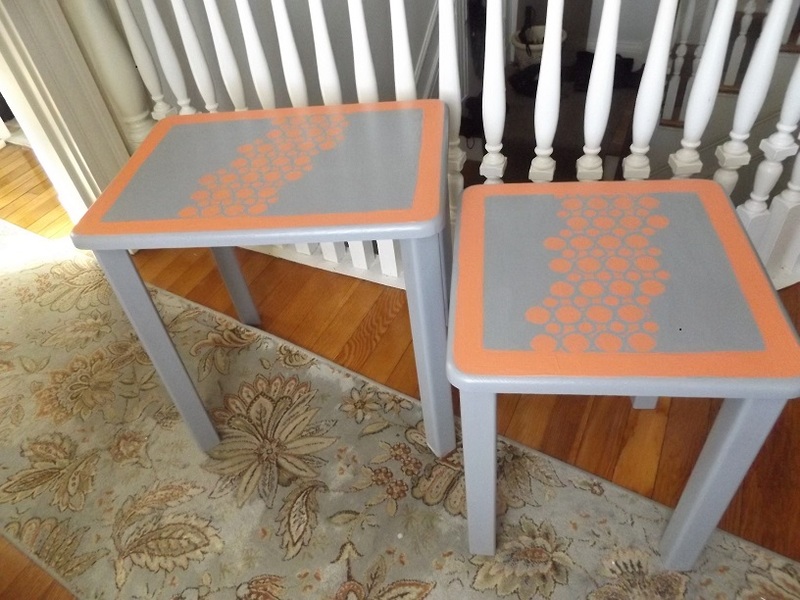 These Can Be Yours if The Price is Right! The snow if finally melting and spring is in the air even if is 23 degrees outside!! I guess I’ll be working on furniture INSIDE for a while!! I’ve been busy. I’m trying to get as much finished now while I have a little time before my job starts to take over my time and energy. Here are the latest pieces I’ve finished. 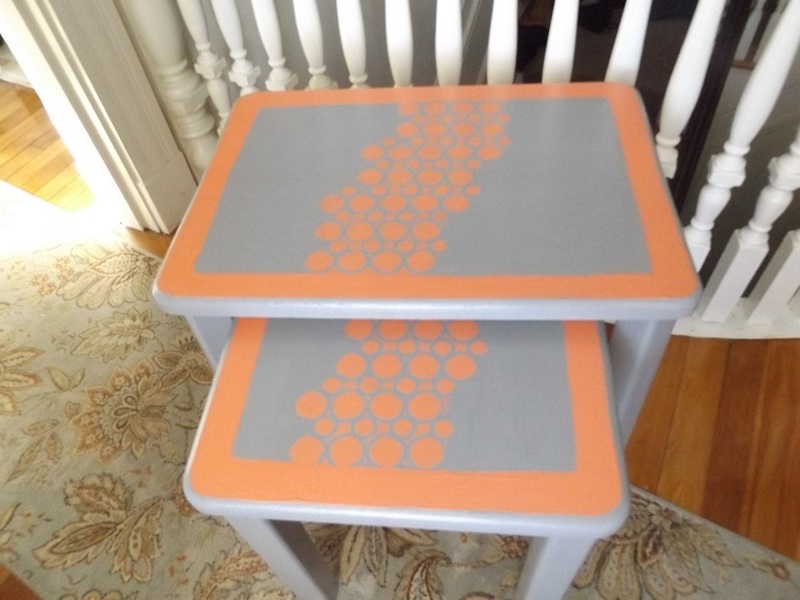 I’m the first to admit that the photo doesn’t due justice to this pair of tables. The color looks wonky, and they’re much cuter in “person.” The orange isn’t as sherbert looking when you see them its more of a peach. 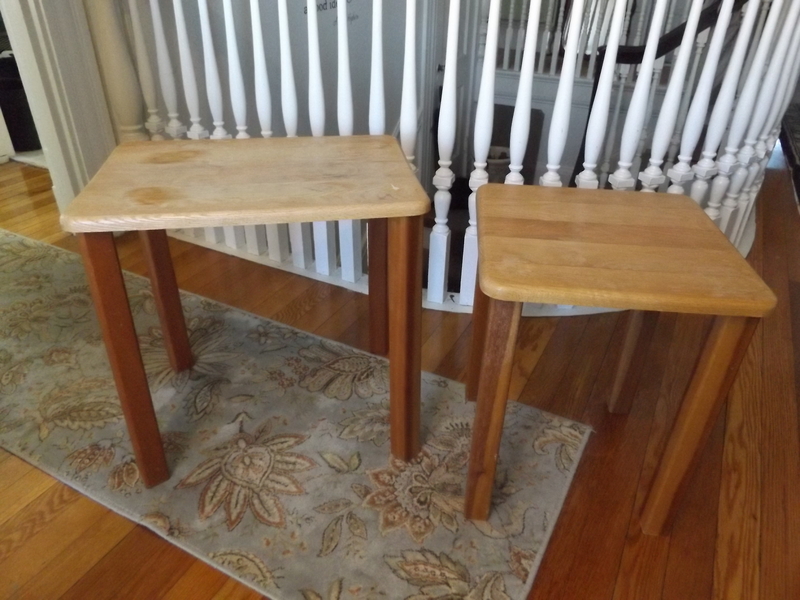 You can put them side by side or stack them; they’re great for small spaces as most of my pieces are. 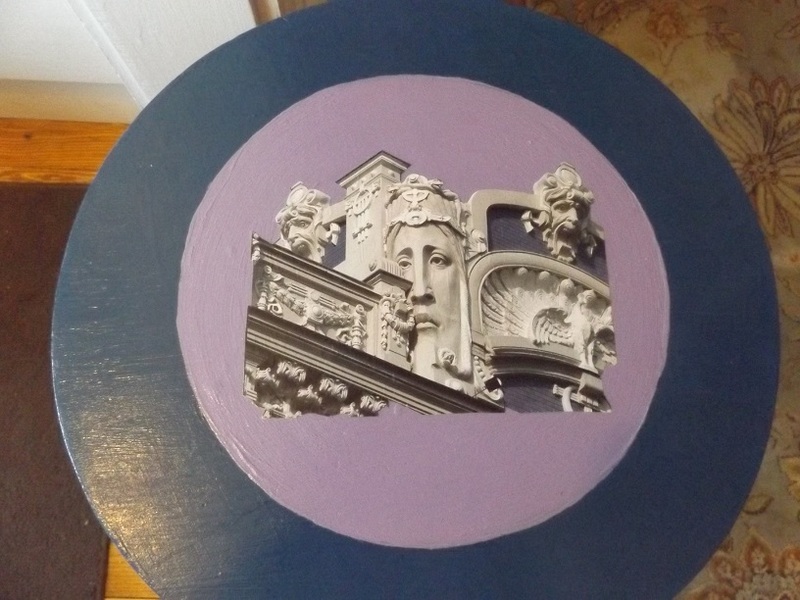 The next piece is another from the “Sousa Collection” as I’m now calling pieces given to me by my friends Gus and Ann. 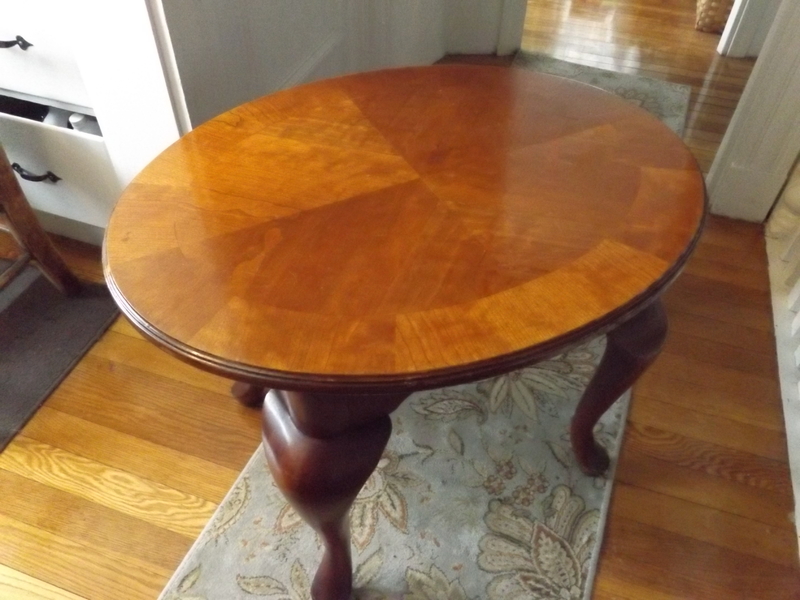 It’s a great table, but was just sort of …blah. Inspired by the shell carving, I tried to give it a little “beachy” feel to it. The top actually looked pretty good so I left it as it was. 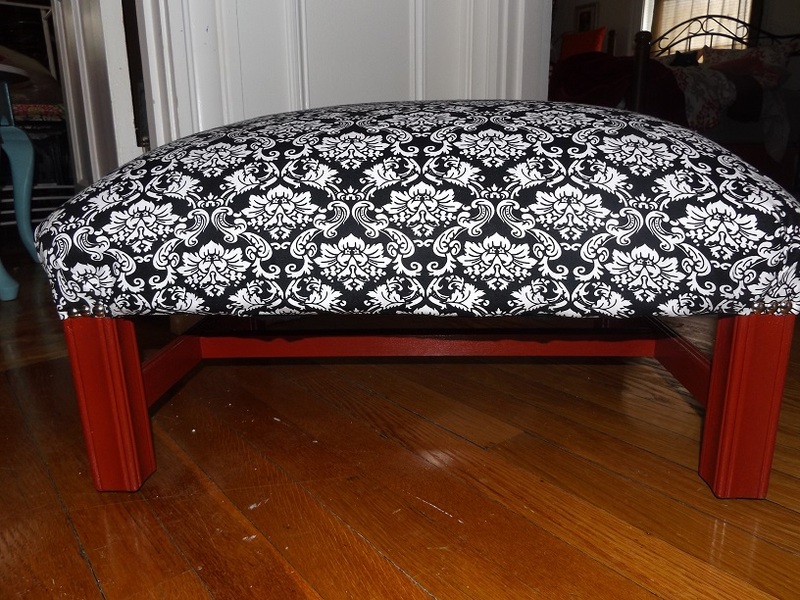 Moving onto upholstery: Okay so you may remember that I took an upholstery class a couple of years ago. 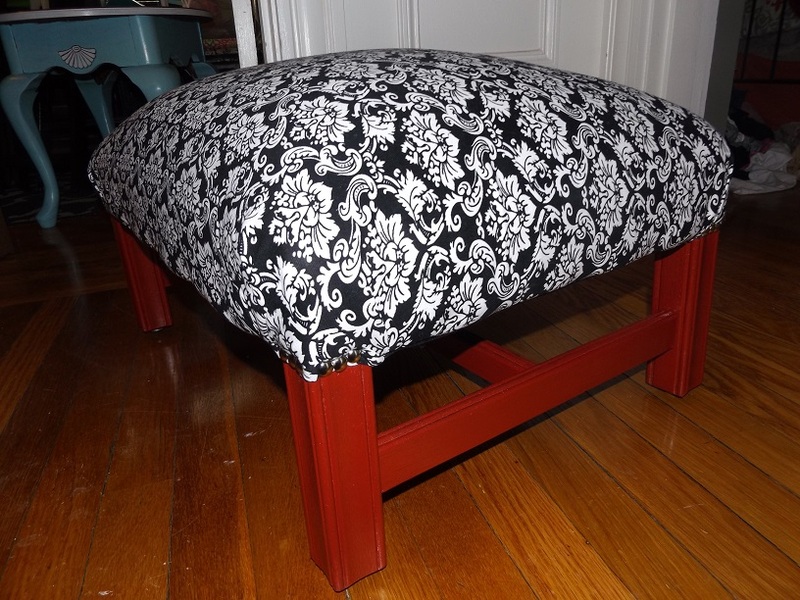 I learned how to redo an ottoman. Not hard, but frankly, most of the steps I’ve forgotten. 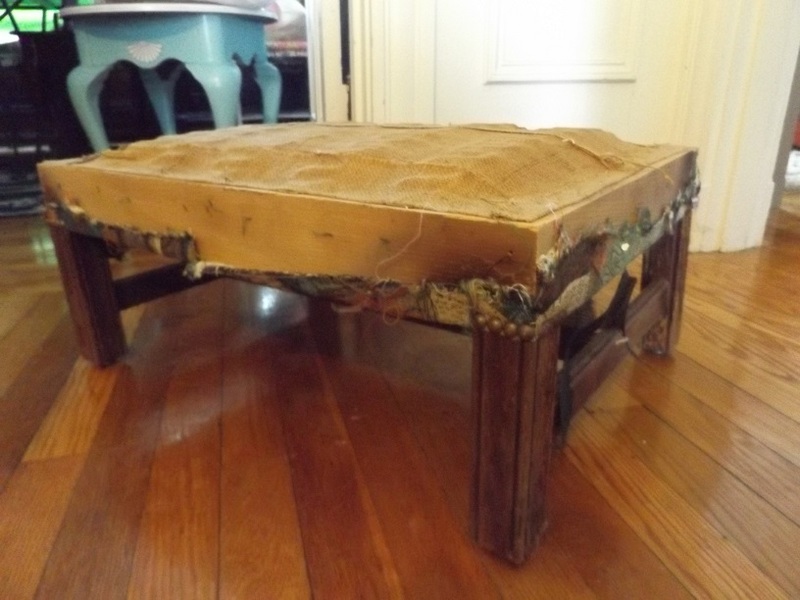 But I found this horrendous ottoman in a thrift shop and thought I might be able to manage re-doing this one. I did! 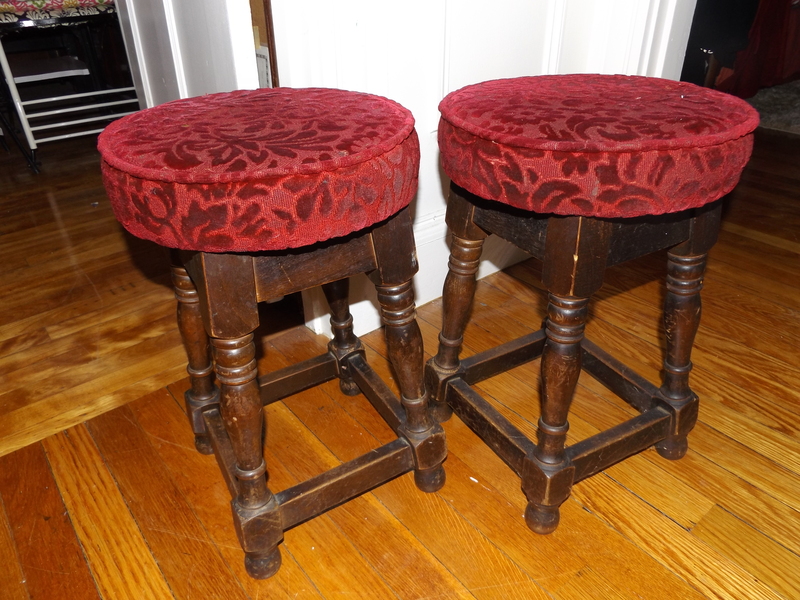 I found these God-awful stools on the left several years ago in an antique mall long before I ever thought about flipping furniture. I just thought they’d be good things to have. They’ve been waiting for several years to have a make over and now that I had sewing machine, their time had come. What a difference! I think it’s really weird that the proportions even look different. I didn’t replace the cushions, just recovered. Over all I like them, but up close my novice sewing skills are obvious. I just hope someone will still appreciate and want them. 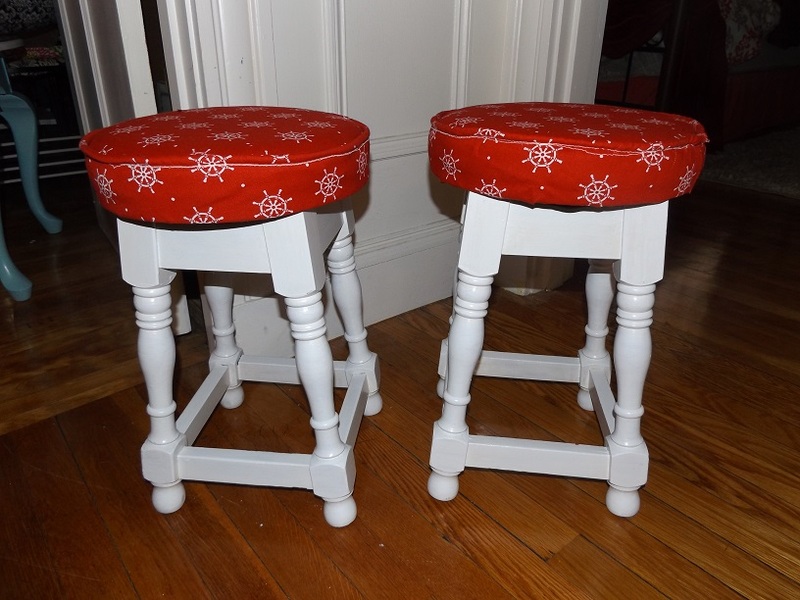 A lot of work went into these little stools, much to my surprise! 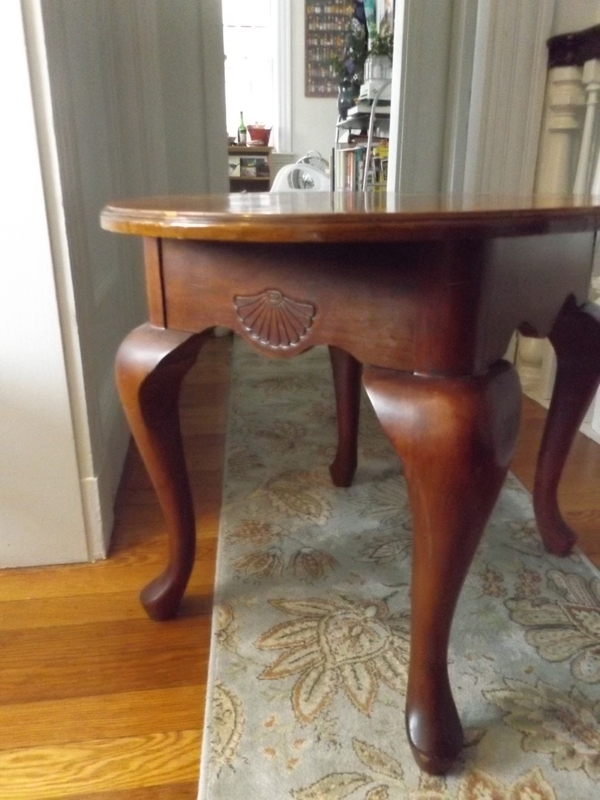 One last piece for this post is this little table. Poor thing was suffering and identity crisis, it couldn’t tell me what it wanted to be. That was partly my fault. It was slated to be the base for another table top I was working on, but I decided it’s just little too small for what I had planned. So it got put aside for another. 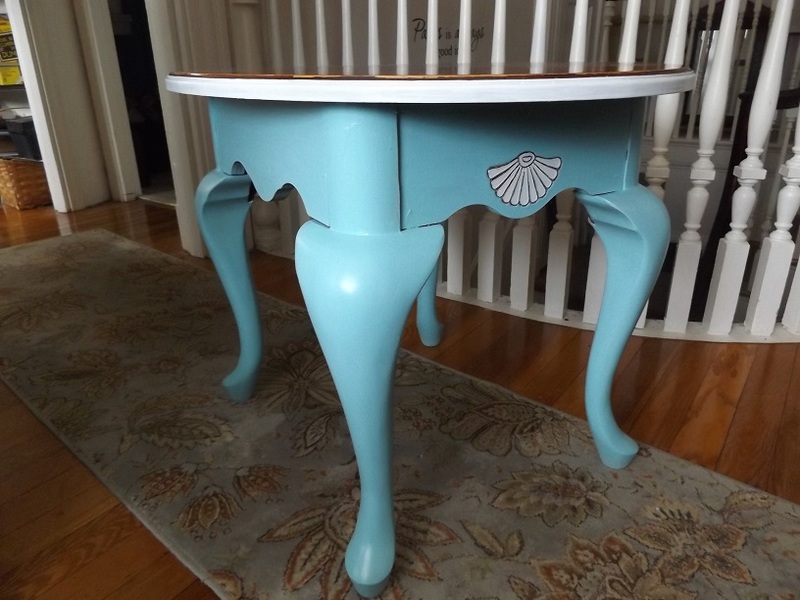 It just sat there for a week not being able to tell me what color it wanted to be, or if it wanted to be painted, or decoupaged. Finally we came to an agreement, he got a little bit of both. I have more to show you but I’ll leave you for now. 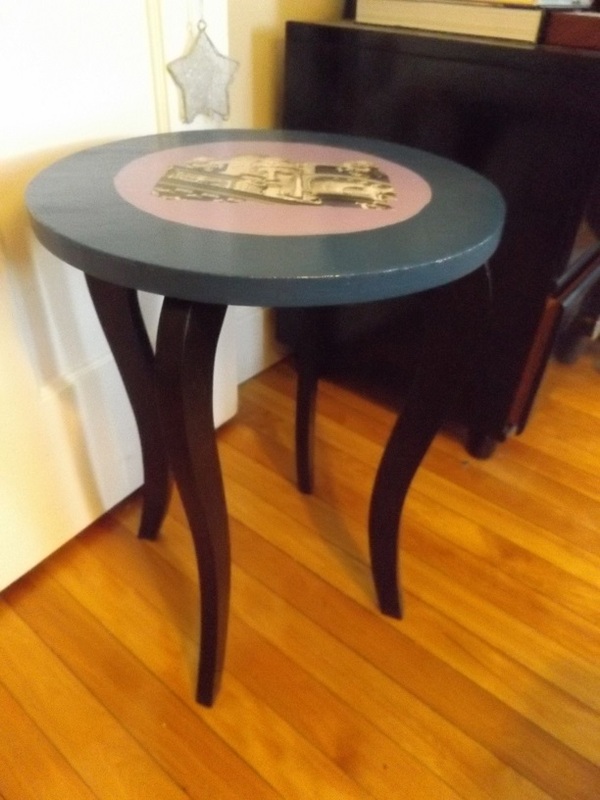 The next post…maybe later today will show you that table top this little table was supposed to go with. I think the final result is pretty nice. Stay tuned! ← The Snow Has Kept Me Productive!